Next stop…The Magic School Bus heads to the forest to learn about aerodynamics. Ms. Frizzle’s class is putting on a play of The Three Little Pigs. The kids want to build a house for their play that even a super-powered fan can’t blow down. 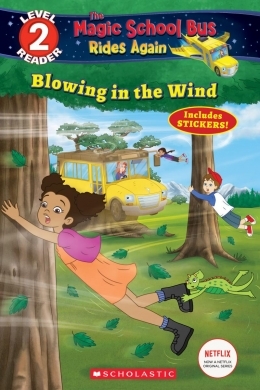 So Ms. Frizzle and her Magic School Bus take the class to the forest to learn how trees stand up to strong winds. Will these little pigs get blown over or learn to stand strong? Includes stickers! This book shows the characters using the scientific method. They try different things to make a building strong and test their buildings. At each point in the story where they’re ready to test their building, have your child guess–or create a hypothesis–what the result will be. Why does the class decide to go on a field trip? What are they trying to figure out? Where did the bus take the class? Talk about what engineers do. Why is it important to test buildings? What happened when Keesha pressed the wrong button on the bus? How did the class change their building design to work more like trees? Do you have any different ideas about how you could make a strong building? This book has a glossary. Look for each glossary word in the book to see how it’s used. Then have your child try using each word in a new sentence for vocabulary practice.